#1 - Betty's Tasty Buttons - Betty’s Speakeasy offers their Tasty Buttons in a variety of seasonal flavors, including white chocolate eggnog and dark chocolate with cranberries and orange zest. Crafted using local cream and local goats’ milk, the bite-sized pieces of fudge are packaged in locally-made boxes. #2 - Vegan Treats - The first thing you notice about Danielle Konya’s Vegan Treats is their decadence. Think pumpkin bundt cake with chocolate drizzle, sticky buns the size of your hand, oozing chocolate peanut butter mousse bombs and cupcakes in flavors like Black Bottom Cream Cheese and marshmallow. All of Konya’s creations are completely animal-product free and made in her Bethlehem, PA, shop. #3 - Market Day Canele - Eating a canelé is a distinctive experience—a delicate marriage of textures and flavors—and the traditional French pastries are almost as difficult to make as they are to describe. Market Day’s Gil Ortale says he cried buckets of tears over the fickle sweets before finally mastering their caramelized exteriors, delicate ridges and moist custard-like centers. #4 - BT Brownies - The name Better Together (BT), coined by owner/baker Todd Kelly’s wife Kestra, is a love note between the couple and a testament to the passion put into their renowned brownies. Organic flour, evaporated cane juice, fair trade chocolate and Lancaster County dairy come together to create BT’s four signature flavors—peanut butter, cookie, chocolate and pumpkin. 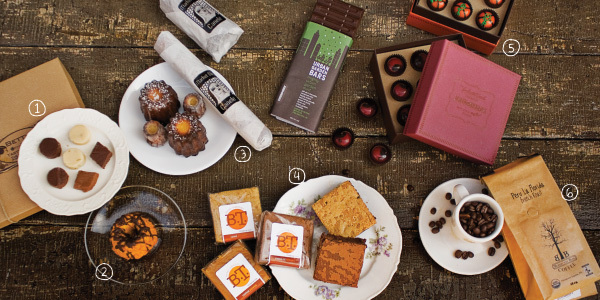 #5 - John & Kira's Chocolates - The beloved local chocolatiers’ seasonal additions include Spiced Pumpkins, handpainted bonbons filled with pumpkin pie-flavored caramel, and Chocolate Cherries, naturally-dried tart cherries with chocolate ganache and a hint of brandy. They’ve also launched a line of “Urban Garden Bars,” including one made with dark chocolate and fresh mint from the Urban Nutrition Initiative’s school garden. #6 - Burlap & Bean Coffee - A small-batch roaster based in Newtown Square, Burlap & Bean offers a host of house blends and single origin coffees. For your favorite caffeine junkie, they curate six-month and 12-month “Coffee Tours”—the lucky giftee will receive a different variety of freshly-roasted, organic, fair trade beans every month.